The Ukrainian private shelter “”Best Friend”” is located in a wooded picturesque area near the city of Kiev. The construction of the shelter was launched in April 2014 and is still in process. The main investments for the foundation and maintenance of the shelter “”Best Friend”” were made by an individual who really cares about the fate of homeless animals in Ukraine. In November 2015, the animal protection organization “”Zoocenter Kovcheg”” was founded on the basis of the shelter. In addition to saving dogs, the organization staff help wild animals and birds. 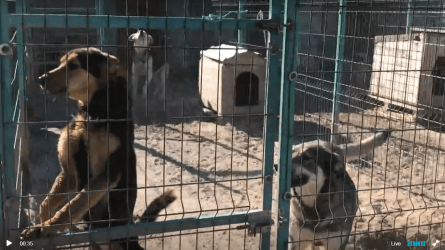 At the moment, 267 dogs, 157 cats, 2 horses, 1 goat, 2 raccoon dogs, 1 wolf, 2 crowns and 1 pigeon live in the shelter’s territory of 1.5 hectares. In addition to saving and treating sick animals, the organization socializes and sterilizes the animals and helps them find new owners. Each of these animals has a sad life story and dreams of being loved. Each of them wants to find a new home. For this reason, the organization is always happy to help all those who decide to find a new loyal friend in the shelter “”Best Friend””. The organization always encourages anyone who is willing to spend their personal time to become a volunteer in the shelter and help the other workers of the shelter improve the quality of life for the shelter’s pets.